Born in Santa Catarina Chinango, Oaxaca in 1945. As a young child, he would make his own toys and copied the prints of revolutionary tales of Alberto Beltran. He moved to Huajapan de Leon in order to attend school since there was no elementary school in Chinango. He worked as an apprentice to Rafael Lopez, restoring antique religious images from 1960 and until 1962. Later, he went to Mexico City and joined the army where he made limbs for soldiers who had suffered accidents and he also started sculpting busts of historical figures. He attended the Academia de San Carlos and learned to sculpt in stone from 1966 and until 1970 studying with Manuel Silva Gerrero, Alberto de la Vega and Elizabeth Catlett. After 1970, he worked at the Taller Experimental in San Carlos and a year later started working for Anastasio Nequiz in Chimalhuacán. After graduating, he became a professor at the Taller de Escultura in San Carlos and other institutions. In 1981 Ortiz collaborated with other famous artists to make the mural at the Palacio Legislativo in Mexico City. His work, as many of his Oaxacan contemporaries shows the magic and culture of this ancestral Indian land. 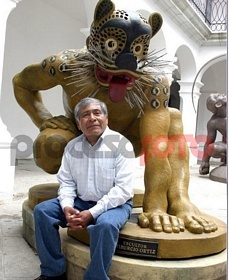 His most notable exhibitions are "Esculturas y proyectos" (1973), at the Galería José María Velasco at INBA; Ivy Gallery, in Los Ángeles, California (1989); Grayhome Gallery, Phoenix, Arizona (1996); Gallery Crashing Tender (1998), Gallup, Nuevo Mexico; and "Na-Ii Yuu Ka-Ah: gente de piedra que habla" (2002), Instituto Mora, Mexico City.